Everlane is working, one city at a time, to eliminate the worst part about online shopping: Waiting for the purchased jawns to arrive at your doorstep. The tech brand launched its Everlane Now service, which promises to deliver your order in 60 minutes or less, earlier this year in San Francisco. Thankfully, the program is also now available in New York City. Everlane already makes some of the best basics in the game, but the company is staying true to its startup roots by staying innovative. “The future of online is incredibly fast delivery,” said Everlane CEO and founder Michael Preysman. Just like in San Francisco, Everlane is working with Postmates— the leading company for bringing you practically anything from stores and restaurants that otherwise don&apos;t offer delivery—to get orders to you within the hour at the same price of standard delivery. Check out the range of products, from basic tees and hoodies to bomber jackets and bags, that could be yours within the hour on Everlane&apos;s website. 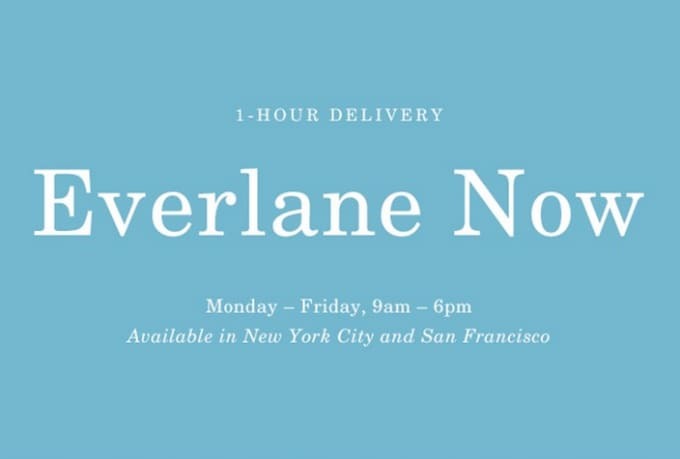 Everlane Now is available to select zip codes in Manhattan and San Francisco Monday through Friday from 9 a.m. to 6 p.m., with extended hours kicking in soon for the holidays.